When it comes to motorbikes, passion and performance go hand in hand. Here at WD-40, we know that performance is everything. You want your bike to run, look and sound the very best it can. Whether you’re riding in front of 20,000 fans or a herd of sheep as you take the scenic route home, we’ve designed the WD-40 Specialist Motorbike range with performance and passion in mind. WD-40 have worked to ensure that our products meet your needs, regardless if you’re a biker or team mechanic. We’ve developed our formulas in conjunction with the University of Sheffield, and even created an anti-fling test for chain-specific formulas. This keeps the product working where you’ve applied it. 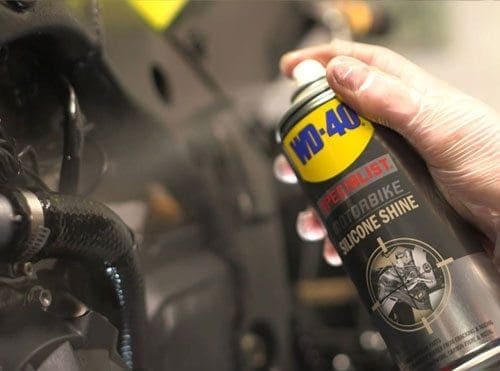 We also test all our products with Team WD-40, from the British Superbikes Series, to ensure our range consistently meets the standards of high performance race environments. Whatever your bike needs, our Specialist Motorbike series has a product for it. If you’re looking for a brake cleaner that easily dissolves oil and brake fluid from brake discs and clutch systems, Motorbike Specialist Brake Cleaner is ideal. You can also easily clean grease, oil and grime from chains with our specialised Chain Cleaner. For a fast-drying, long-lasting lubrication on O, X and Z rings, grab our Chain Lube, or try our Chain Wax if you need something which lubricates and conditions your bike chains while protecting them from wet conditions. Give your bike that professional shine without the need to buff using Motorbike Silicone Shine. You can add a deeper gloss finish to the paintwork with Specialist Motorbike Wax & Polish too. For fast and hassle-free cleaning, Total Wash is your valet in a bottle. Simply spray it on and rinse it off to remove traffic film, dirt, grime, oil and road residue. Whatever your needs, WD-40 Specialist Motorbike has you covered.